My season plan was to do a couple of sprint tri's at the start of the year, and then a couple after track season was over. Planning is increasingly difficult due to the kids schedules. 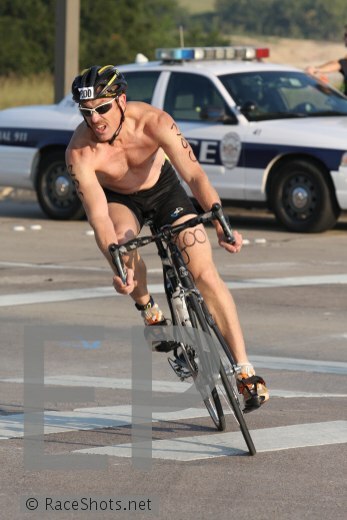 At the start of this week I received authorization to sign up for the PlayTri Stonebridge Ranch Triathlon. The one interesting twist was that this race featured an open water swim. You see, I have never done an open water swim in a race. In fact, I never have even practiced open water swimming. If there is swimming to do, why not do it in a perfectly good pool? Yeah. The swim was 750 meters. The distance was no big deal - although the longest swim I have done in a race was 400 meters. Before the start Vic told me start wide. That was the big plan! The air temp was in the mid 60s at the start. The water temp was 76. I expected that to feel cold, but it actually felt pretty warm to me. My wave was the last one to start. I lined up wide and then we were off! I went out hard, but not too hard. it was a clockwise loop of this lake and since I breath to my left I was able to sight the shore as I swam. After a couple of minutes I settled into a strong pace and then I took a sighting of the first turn. EVERYONE was way to my left! Ahem - I was swimming a bit too wide. From there I swam a bit then sighted; swim, sight, repeat - and from then on I managed to stay on track. No one was near me so it was not a difficult swim at all. But of course when I hit the turn I was then in a pack! I made the turn and then proceeded with the swim sight routine. We were now picking through the stragglers from the previous wave. I could not really see them ahead of me, and occasionally had to pause to sort them out. I made the second turn and now we were headed from home. We were also headed due east - meaning straight into the rising sun. I could not see the last buoy when I took a sighting because of the sun in my eyes. So I just followed the pack. After a while I passed a yellow marker which is not the orange one that I was looking for. I was about 10 meters from the exit! I never did see the last marker. I was the second swimmer from my wave out of the water! How that happened, I'll never know. It was a long run to the transition area from the lake. I got through the transition with no issues. I got the on bike and then my Pyro Platform came off. Drats. The Pyro is a platform that allows me to wear my running shoes on the bike. I had to pick the stupid thing up and then get it clipped back into the peddle. Finally I was on my way. The bike course was really crowded. For the sprint it was two loops and for the Olympic it was four loops. And since I was in the last wave everyone was out there ahead of me. I just hammered away and was passing tons of people. And not surprisingly there were the occasional dudes with super bikes that were flying by me. On the second loop I really focused on pushing hard. I felt like I had a really good bike. Finally I was done with the bike. As I ran the bike through transition I got my helmet unclipped, and then I yanked it off, but my glasses went flying off to my right. Drats. Slight pause to pick them up. Then I racked the bike and I was outta there. My T2 was 47 seconds which tied me for 6th in the race and broke my streak of two T2 wins in a row. I was 10th overall , and first master. I was 12th overall on the swim, 35th on the bike and 6th in the run. Victoria was 10 seconds faster than me in the swim, and we were dead even on the bike. That is a big improvement for me relative to the Tri-Rock. All in all, I have to say this felt like my best triathlon to date. Wednesday Sep 17 - 64 minutes Easy Distance from Lifetime Plano 7.5 miles run (162). Saturday Sep 20 - 90 min run - richardson, murphy, plano loop - 11.2 miles run. Sunday Sep 21 - Bike w/Terry then Vic; ave 16.6; cad 76; ride time 3:37 - 60.2 miles bike. Continuing on Circuits this week. Wednesday, I pioneered a new route from the gym. Turns out to be 7.5 miles, I was hoping for closer to 8. I'll need to fine tune that. Friday, I kicked it up a notch in the pool - I am now shortening the recovery on my swim intervals. Saturday Terry and I decided to try to get a quick ride in before Ike hit Dallas. Just as we got back to the neighborhood, it started to rain. Terry and Vic went out for some more, but I had to get done so that I could get to Reagan's gym meet. Not surprisingly all soccer was canceled Saturday and Sunday. Sunday morning was great - after Ike blew through it was nice and chilly so I did my 90 minute loop for the first time since March?? Wow! Wednesday Sep 10 - 64 minutes Easy Distance from Lifetime Plano 7.5 miles run (163). Friday Sep 12 - 500WU, 3x(3x 100 on 1:50 with 30 sec extra rest btw sets), 100 kick w/fins, 3x(6x 50 on 55 - xtra 90 secs btw sets) ,100 kick w/fins,500 Pull - 3000 Swim. Saturday Sep 13 - 2:05 hours bike, To Preston and LBJ w/Terry - ave 16.4; cad 77; - 34.2 miles bike. Sunday Sep 14 - 90 min run - richardson, murphy, plano loop - 11 miles run. Monday I almost forgot about circuits after having spent the weekend in Austin. I spent most of monday taking the TeeVee apart because it had blown up. But finally late in the evening I headed out and got them done. For my Wednesday Long Run, I am still working on a route as good as the one from the old office. Saturday Terry and I got up at ODarkThirty and had a great ride around Lake Lavon - including pioneering some new routes. Sunday Victoria wanted to ride. But she wanted to go slow and start late and not do too many miles. After all it was just one week since her Iron Man. So I got up early and knocked out 10 miles then picked up Vic and took her on some parts of the ride that Terry I did. My ride times were within a minute of each other both Sat and Sun! Wednesday Sep 03 - 60 minutes Easy Distance from Lifetime Plano 7.5 miles run (162). Friday Sep 05 - 200 WU, 2x50, 5x100 pull, 500, 10x50, 5x100, 500, 200 - 3000 Meter Swim. Saturday Sep 06 - 2:37 hours bike, Lake Lavon Loop w/Terry 17.8 Ave, 82 CAD - 46.8 miles Bike. Sunday Sep 07 - 2:38 hours bike, Short Lavon Loop w/Vic - 44.3 miles bike. Marissa's Sting 95 Team played their first league game against FC Dallas Silver, coming up with a 1-1 draw. Logan's SDL Team lost to Polaris 0-1. Reagan's PAL team beat Meja 3-1. Reagan also participated in her very first Level five Gymnastics Meet, scoring over 33 points all around. This week I started doing my plyometric circuit routine in preparation for fall running. I am doing circuits on Monday and Thursday, Swiming Tuesday and Friday, and I'll try to do a 60 min run every Wednesday. 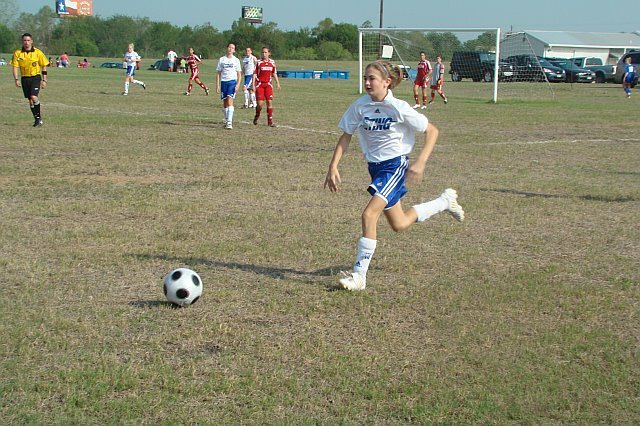 On Friday, this week, we needed to head south to Austin for Marissa's Soccer Tournament. Sadly I ran out of time before we needed to leave so I could only squeeze in 30 minutes (1500M) of swim time before heading out. Even then I probably cut it too close. Saturday and Sunday I had to get up before 5am if I wanted to run. I managed this without too many problems, and I had two really nice runs down to Town Lake then along the east side of the lake from I35 to the pedestrian bridge and back. Wednesday Aug 27 - 55 minutes Easy Distance from Lifetime Plano 6.8 miles run (160). Friday Aug 29 - 500WU, 500 pull, 500 WD - 1500M swim (163). Saturday Aug 30 - 60 min easy distance, town lake, Austin Texas - 7.5 miles run. Sunday Aug 31 - 60 min easy distance, town lake, Austin Texas - 7.5 miles run. Monday was the first day back in the office after my week away. I was dragging, and then on Tuesday, I had a 6:30am flight to Houston - so I was outta bed at 4:00am. I had presentation training in Houston but after the class I drove down to Sugarland and was able to knock out 3000 in the pool there. After my swim the scale there reported 166! Ouch. Wednesday, I was dragging when I got up at O Dark Thirty to do a run through the Houston humidity. Then it was all day in the stupid class, then back to Dallas. Except the plane was scheduled out of Houston at 8pm, but was delayed until 9. And as a result I had a few extra beers at the airport. Thursday I was really feeling beat up with all the travel over the last few weeks. So I decided to do a 300 trial in the pool in the form of 6x50 hard as preparation for Sunday's TriRock Triathlon. And then on Friday I took my first rest day since March 29 and only the fouth of the year. Saturday Terry and I went out for a short ride, but with a bunch of tempo. Sunday was the Triathlon and I managed to win the Master's Division! That was a first. Tuesday Aug 19 - Sugarland - 500WU, 2x(4x125: 25 hard, 100 easy; 50/75; 75/50; 100/25; on 2:15; Second Set IM on 2:30), 250 Pull, 5x50-25 IMkick, 25 Easyon 75; 250 Pull, 5x50 on 50; 250 Pull; 8x25 on :30 odds with 0-1 breath; 50 - 3000 Swim (166). Wednesday Aug 20 - Houston Texas 40 min, 5 miles run. Thursday Aug 21 - Lifetime Plano - 500 WU, 6x50 on 1 in 40, 500 pull WD - 1300M Swim (162). Friday Aug 22 - Nothing. Saturday Aug 23 - 17.7 Ave Speed, CAD 76, Ride time 1:17, 22.8 Miles Bike with Terry. 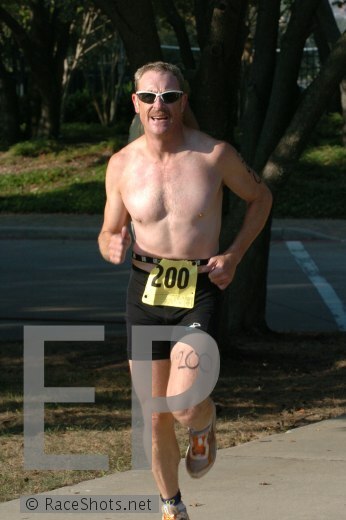 Sunday Aug 24 - The Tri Rock, 500yd WU, 300yd Swim, 13.4 miles Bike, 2.9 Miles run, 2.5 miles run cool down. 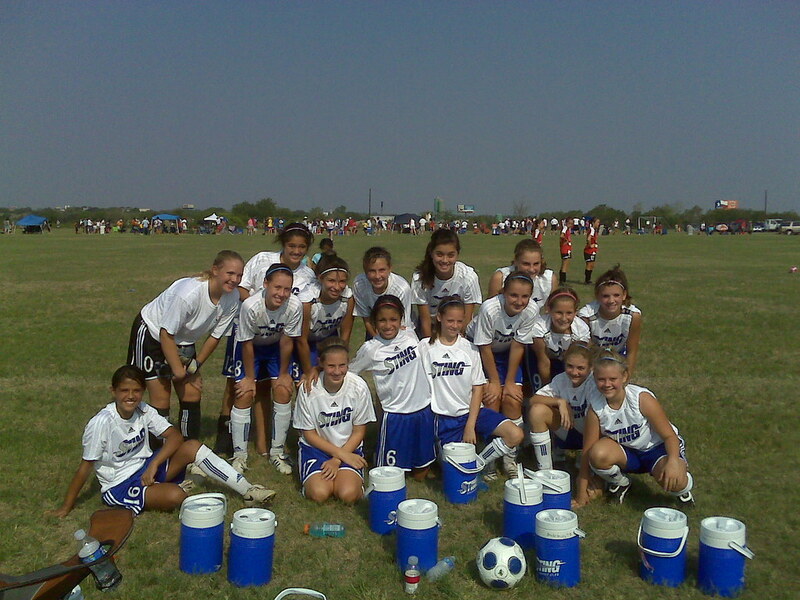 Sting White 95 girls played in the Austin Labor Day Cup - U14 Girls Bronze. The girls tied for third place in their bracket winning the tiebreaker on fewer goals against. This placed them in the Semifinals against Longhorns South, a team that narrowly beat the girls 0-1 in The LHGCL QT. Vengeance is a dish best served cold. The girls drew first blood early in the first half, a lead they held through the break. But the Horns came back strong and evened the match in the opening minutes of the second half. And so the match was to be decided on penalty kicks. Sadly, they stopped the fifth kick from our team winning the PK battle 4-3. The girls demonstrated incredible tenacity and poise in Crushing crossfire in a must win game to get to the semis. And likewise narrowly missing the trip to the championship.